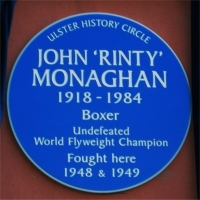 ‘Rinty’ Monaghan became the world flyweight boxing champion at the Kings Hall, Belfast in 1948 and retired undefeated in 1950 at the end of a sixteen-year professional boxing career in which he fought sixty-six contests, winning fifty-one, drawing six others and being beaten only nine times. John Joseph Monaghan was born on 21 August 1918 at 23 Lancaster Street, Belfast and, after marrying Frances Thompson in 1938, he moved to Little Corporation Street, in the Docklands area of the city. There he raised his three daughters, Martha, Rosetta and Colette and son, Sean, and lived for the rest of his life. Earlier, while still at school in St Patrick’s Christian Brothers at Donegall Street, aged just 11, he began taking part in street boxing contests earning a fish and chip supper when he won. By the time he was fourteen he was picking up purses of a few shillings for victories and at the age of fourteen was well on the way to a professional boxing career, training in a tumbledown gym in Hardinge Street. 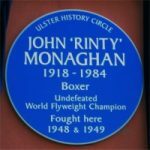 There are conflicting versions of how he acquired the enduring nickname ‘Rinty’: one says it originated in his childhood because of his enthusiasm for ‘Rin Tin Tin’, the heroic German Shepherd dog, which starred in a series of popular 1920’s movies; another is that it was a tribute to his nifty footwork in the boxing ring. Whatever the truth, his early career was highly successful and he did not suffer a defeat until he was knocked out by Glaswegian Jackie Patterson during his twenty-fifth professional fight in 1938. The defeat was only a temporary setback but Monaghan’s career was interrupted by wartime service in the Navy which chose not to exploit his fighting instincts but sent him instead to such places as Norway, Gibraltar and, in 1944, forty-eight hours after D-Day, to Normandy where he entertained the troops as a song and dance man. 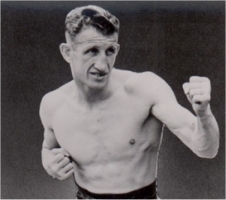 He managed to fit in a small number of fights during the wartime years but in November 1945, out of uniform and back in full training, Monaghan knocked out Eddie ‘Bunty’ Doran to win the Ulster flyweight title. His target now became the world title and in 1947 he beat Londoner, Terry Allen, the fight being stopped in the first round. Later that year he lost then won against Dado Marino, securing the NBA flyweight title. 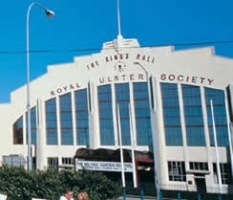 In March 1948, there followed the highpoint of his career when he knocked out his old adversary, Patterson, in the seventh round of a fight at the Kings Hall to become the undisputed British, Commonwealth and World flyweight champion, reputedly the first Northern Ireland boxer ever to hold a world title. Monaghan later claimed that the clinching factor in his pre-fight preparations had been a diet of goat’s milk and raw eggs. As Patterson was carried from the ring, it was besieged by thousands of jubilant supporters and Monaghan later said he had to fight again that night, this time to reach his home through the milling crowds in York and Corporation Streets where celebratory bonfires had been lit. 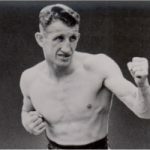 By this time, Monaghan had developed a chronic lung and sinus condition and in April 1950, aged 32,he was forced to renounce his titles and retire undefeated. He tried to make a comeback a few years later but he was refused a licence to fight again professionally and finally hung up his gloves. At that point, it was calculated, he had fought a total of some 180 bouts. Of the sixty-six officially recorded contests, he won fifty-one, drew six others and was beaten only nine times. From his £3,500 purse for winning the world title, Monaghan bought a radiogram and a large three-piece suite, which left hardly any room in his tiny terrace house. Although he made good money, but not a life changing fortune, from his boxing, it was quickly dissipated for he was badly advised and fell for too many hard-luck stories. Trying to cash in on his undoubted popularity as an entertainer – he had always performed his trademark ‘When Irish Eyes Are Smiling’ at the end of his fights – he went on the road as a singer with a small band and even tried to train winning greyhounds. He also indulged heavily in his passion for snooker, several times reaching the finals of amateur competitions. In the end, although no other boxer ever stripped him of his titles, the taxman relieved him of his remaining money forcing him to work successively as a taxi driver, lorry driver and then a petrol pump attendant to make a living. For the rest of his days, Monaghan was philosophical about his lot and said he had no complaints. 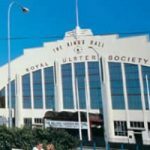 He remained a much loved and highly popular figure and, as he went about his various jobs, people throughout Belfast invariably recognised the battered little man with his twinkling eyes and permanent smile. He remained, too, a gregarious figure and is widely remembered for his constant willingness to burst into song, his eye-popping impersonation of ‘Popeye the Sailor’, tap dancing and mouth-organ playing. On one famous occasion, he entertained a train load of ex-boxers and their friends for the six hour duration of an excursion by train to Cork. His sense of humour did not desert him in 1976 when a local radio station wrongly broadcast news of his death. ‘I’m not floored yet,’ he chuckled when he phoned to correct the report. Soon afterwards, however, illness forced him to give up his cabaret spots and he finally succumbed to lung cancer and died on 3 March 1984, aged 65. He is buried in the Belfast City Cemetery beneath a headstone with the inscription ‘Undefeated World Flyweight Champion’ etched between the images of two boxing gloves.